Afraid that's all I got. Sorry. :down: Like MBusch, I can't get the new CMS to work. Just to be perfectly clear about the new PostgreSQL DB with the Public Beta. If I download and install using DIM, will I still be able to use DS 4.6.2.120 with CMS and the Valentina BD? Yes, the Valentina CMS will still work for the general release (and for the beta if you don't install the PostgreSQL CMS). ETA: but DIM will add new metadata to the PostgreSQL DB if it is installed and not the Valentina DB . Nice to hear that PG will be the new DB for the content manager. 1) Does DS rely on a specific version of PG? 3) Is it possible to configure DS how to connect to PG? The PostgreSQL does not start on my Mac installation. Start CMS manually also does not works. Fallback works as mentioned, if I uninstall PostgreSQL, DS Beta uses Valentina. How can I start the new CMS? 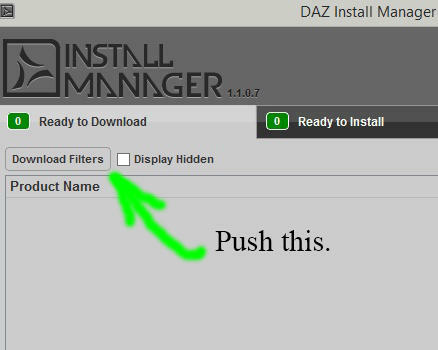 When you launch either Install Manager or DAZ Studio it should automatically launch. We have run into issues where it does not launch from DAZ Studio if you have just closed Install Manager, of just closed DAZ Studio and it hasn't finished its clean up before you launch/relaunch DAZ Studio. Could that be what is happening here? I don't think so. DIM also reports an "Error connecting to CMS". The same message from DS 4.6.3.29 log. I tried uninstall and re-install the Postgre Package twice. Looking at the Activity Monitor I cannot see the Postgre service running. Let me know if I can try any other trick. I have seen something similar when there was a crash on Install. 1. Shut Down DS and/or Install Manager and give it time to exit. 2. Kill the still running PostgreSQL instances. 3. Open Install Manager and see if PostgreSQL is installed, if it is uninstall it. If that doesn't work please file a ticket so we can work with you one on one and get it cleared up for you. Tried hard. It just does not works. No Postgre process running at all. I filled a Support Ticket and attached DIM and DS logs. I uninstalled, rebooted and reinstalled the new CMS files a few times and re-imported the metadata and CMS is now working for me. Which version of Mac OS X are you running? ETA: but DIM will add new metadata to the PostgreSQL DB if it is installed and not the Valentina DB .Note you can reimport Metadata in the 4.6.2.120 version of DS and that will add your new content to the Valentina DB. Note that the way PostgreSQL works you can have multiple databases for multiple applications and they won't step on each other. 1. We are using the current version of PostgreSQL as of about 2 weeks ago. 2. Not at this time, though if you want to create such scripts you could, however we are not supporting that, at this time, you are on your own. 3. Other than port and location, in theory, yes, however we aren't supporting it at this time, you are on your own. 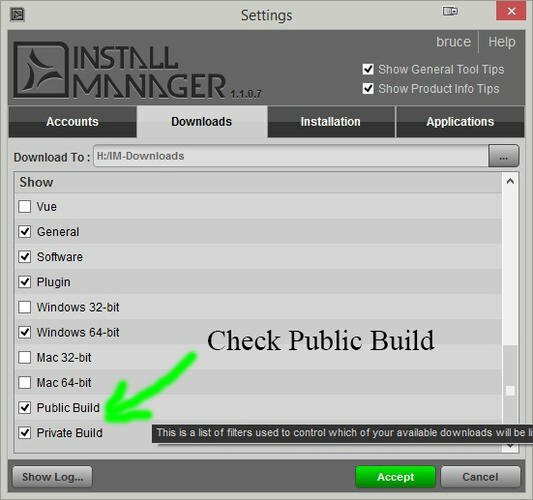 For those people having issues finding the Public Beta in Install Manager. If it still doesn't show up, please make sure you don't have the Public Beta Hidden. Thanks for your reply Spooky! Note that the way PostgreSQL works you can have multiple databases for multiple applications and they won’t step on each other. Yes, I'm aware of this. I already use different databases for different applications. O.K., but do DS rely on this version? To make my question more precise: Which versions of PG do you support? 3. Other than port and location, in theory, yes, however we aren’t supporting it at this time, you are on your own. No problem to be on my own here, but how do you create the roles, tablespaces, schemas, tables etc. without scripts? Can you at least provide the information about the data structure? Do you use a fix name for the database, the schema, for the login role, ...? While you are correct, the first part of the path is "wrong"... "Applications" would be "wrong" in the same way. The base folder of the path doesn't matter for scripts that are executed from their extracted paths, "post" install; the base folder in the path is [explicitly] ignored in this case. Where it does matter is when a script is executed "pre" install, before any files are extracted, as the path actually references the structure within the zip itself. That said, this particular script is run "post" install, so even though the base folder name is not consistent with the structure of the zip... it doesn't matter, because it's [explicitly] ignored anyway. We will be fixing the "not found in zip" error, but that is not what is at fault here; the script runs as expected on several machines also running OS X 10.9.2 that we've tested on, regardless of this log entry. What the script does is build the installed cmscfg.json file*, such that it references the bin directory of the PostgreSQL installation. This is how Install Manager and DAZ Studio know where the PostgreSQL binaries are located; e.g. so they can, for instance, start and stop the PostgreSQL server when they start/stop. This file also serves as the switch for whether the applications fall back to using the Valentina DB; if the file exists and the information within it is valid, use PostgreSQL, if either of those is not true, fall back to Valentina. *You can "Show Installed Files..." from the context menu (right click) or option menu (far right arrow) for the PostgreSQL package, and then click the link for "/DAZ 3D/CMS/cmscfg.json" to open the folder in the OS file browser. "PgBin": "C:/Program Files/DAZ 3D/PostgreSQL CMS/bin"
What I suspect is actually at play here, is permissions settings on the executable files themselves. A script used in the publishing process, for converting a Private Build package to a Public Build package, unzips the package on a Windows machine, makes a couple of tweaks to non-executable files and then zips it back up. The act of unzipping a package intended for a Mac, built on a Mac, on a Windows machine will cause important permissions settings to be lost in the process. I'm looking into it now... and if that turns out to be the case, I'll be updating the package once we've tested it. @ruekaka - I believe that they run their own PGSQL instance, custom configured for their apps needs. If it collides with your instance you should edit what DAZ Studio expects the port to be, that way their locally running instance likely won't have issues with yours. I'm fairly sure they won't be able to use an arbitrary local PGSQL, especially given that they expect to be able to start and stop it with the app. My longer-term desire would be to do something completely wacky: not have to run Postgres locally at all, but have it connect to a machine that I control on the larger internet. (My dedicated host is nicely firewalled off so that only certain machines under my control can reach the DB's ports on that remote system.) That way all my machines can interact with the same CMS database. They already share the content directory via Dropbox, so the underlying directory structure is mirrored. Given what I've seen so far, it looks like that's not possible yet, but this is a small first step in that direction. Use Help > Contact Us to submit a ticket to Tech Support, with "Bug Report" in the title. If you never had the beta before installing those items, they only installed to the general release. If you uninstall and reinstall them with DIM after the beta is installed they will install to both the general release and the beta. huh - go figure.. that fixed it.. Thanks Rob for clarify the workflow. I think you should be correct about the issue: probably is a permission settings. Both *. dzime files not have executable permissions. I changed their permissions in terminal command line, but they still not execute. Do you install using an account that can admin (do sudo)? Yes, I am sure that. Yes, I am sure that.We think we have it figured out, and why it works here at DAZ plus on our tester's systems. The one that went out with this Public Beta was zipped on a Windows machine. The one we have installed on Macs here at DAZ, and sent to our smaller test team and used in testing before sending this to you guys was zipped on a Mac. Zipping an application on Windows can cause permission errors on the Mac. Working on getting a new build together. Oops. Thanks, I got the message and tested the new package. It does not work still. I send comments in the ticket. Thank you for this. Found the updates and installed.